Is Lack of Data the Biggest Challenge for Early Phase Pharmacovigilance? We recently hosted a webinar on the challenges of Pharmacovigilance in early phase clinical trials. 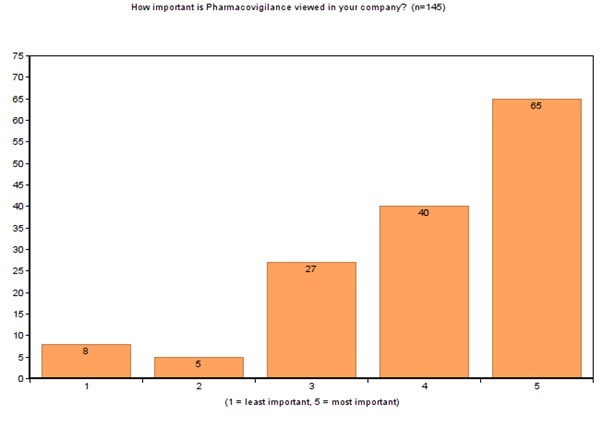 During the registration process we had the chance to survey members of the industry, 70% of the respondents were from pharmaceutical, biotechnology or medical device companies. We wanted to present the data from the 150 respondents in this blog. 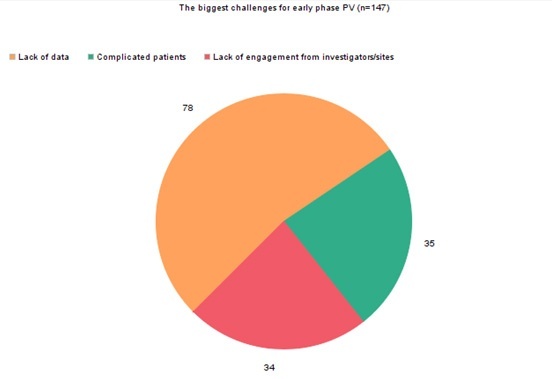 When asked what the biggest challenge for early phase Pharmacovigilance was, the majority of respondents said it was due to a 'lack of data’, followed by equal shares of ‘complicated patients’ and 'lack of engagement from the investigators/sites’. These data demonstrate that lack of data is an unavoidable challenge in early phase clinical trials and not one that can be easily addressed. As we will explore further in this blog, processes can be put in place to mitigate some of the effects of complicated patients and lack of engagement, but limited data is something which is very difficult to change. Our second question asked how important pharmacovigilance (PV) is in early phase clinical trials on a scale of 1 to 5. Not surprisingly we saw 5 as the most important, gaining the majority of votes. However, 28% of respondents gave a rating of 3 or below, proving there is still some way to go to raise the profile of PV within the pharma, biotech and medical device industries. PV is often seen as a tick box exercise and something that costs an organisation money, rather than generating profit. However, we believe it should be looked at the other way, that a robust and proactive PV system can save money and minimise loss of profit further down the line. Drug development programmes are expensive and particularly within small, one product companies, limited resources often see PV pushed to the back of the queue. Often the focus is on getting a new product through Phase I and early Phase II trials at minimal cost and only invest in a full PV system once the initial results are looking positive, or even delaying until it’s time to submit for Marketing Authorisation. However, early investment and planning of PV can anticipate and manage regulator questions before they have arisen, reducing delays in license application and the need for additional clinical trials or post-authorisation safety studies (PASS). Retrospective development of a PV system into a development programme, or in preparation for a post-marketing system is costly and delivers few of the benefits of advanced planning. Based on the challenges presented in the webinar we wanted to go into more detail about some of the solutions to these issues in early phase trials. In first-in-man or first-in-class trials, we are often just dependent on pre-clinical work that has been conducted. A historical lack of transparency can make building on previous knowledge difficult. Once the trial has begun, it is also with just a small number of patients. In the case of healthy volunteer studies, adverse event (AE) and serious adverse event (SAE) numbers may also be even lower and unrepresentative of the safety profile of the investigational medicinal product (IMP). Lack of AE data makes signal detection difficult and all available resources should be used to optimise analysis. A high level view should be taken to identify emerging trends, along with preclinical work/known class-effects, to target known or suspected effects of concern. On a practical level, there is no reference safety information available when a development programme begins, so all cases will be considered unexpected from a regulatory perspective. This can lead to a large number of Suspected Unexpected Serious Adverse Reactions (SUSARs), which can be a challenge to report with regulatory timelines if the appropriate PV system is not put in place. In trials conducted on patients rather than healthy volunteers, it can be a challenge to identify the effects of the IMP. Multiple confounders, such as underlying medical conditions and concomitant medications can cloud the picture. Particularly in oncology trials, patients will already be very ill and would have received multiple lines of therapy. In addition, we must always be aware of the potential for drug interactions and overlapping toxicities. Data collected must be robust and there must be good communication with sites and cross-functionally to ensure that a detailed picture can be built up on each patient. Returning to the theme of limited information, it is easy to just look at SAEs in PV, but this does not tell the full story, AEs, lab data etc. should also be utilised. Bringing together more data sources to analyse a patient’s story can ease the challenge of complicated patients. Ensuring that data collection systems are as robust as possible and serious adverse events are not frequent occurrences in early phase, healthy volunteer studies can be a challenge. As such, many investigators and site staff may not have much every day practical experience of PV processes. Therefore protocol definitions should be clear, and training on reporting requirements and timelines unambiguous. This should all be backed-up with training of site personnel. Using pre-clinical knowledge to identify potential risks, the protocol should be used to highlight medically important events that should be reported to PV immediately, along with SAEs. Protocol development is also an opportunity to put in place the right tests and focus on the areas of data collection that are anticipated to pose the most questions further down the developmental line. Phase 1 trials shouldn’t just be seen as a hurdle to be overcome, but to be setting a programme up correctly to make sure the on-going developmental pathway is as smooth as possible as the compound moves through the different clinical trial phases. Quanticate offers a full suite of pharmacovigilance services from case reporting, signal detection to literature reviews and have supported clinical trials through all clinical trial phases and therapeutic areas, especially oncology studies. If you would like more information on how we can assist your trial please Submit a RFI and member of our Business Development team will be in touch with you shortly.